INSTANT WIN GAME: Wendy's Win Your Perfect Pair (Sweepstakes & Coupon!)! 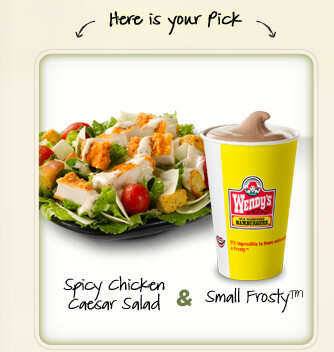 Wendy's has a fun new instant win game called Win Your Perfect Pair Instant Win & Sweepstakes. You first pick the prize that you would most want to win. Then you do a little quiz to determine what kind of combo you like best . . . and all I can say is Wendy really gets me . . . she knows just what I like! ;-) She knows I love dessert (Frosty's!) and Spicy chicken (I love spicy anything!). If you don't win an instant win prize, don't fret . . . you still get a coupon for $1.00 off 2 items! That could make for some super cheap spicy chicken nuggets! :-D Try your luck here & let me know if you win! Wholly Guacamole: $1.50 off Coupon!!! Dollar General: $5 off $25 Printable Coupon!